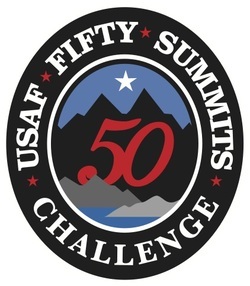 With the huge success of the USAF 7 Summits Challenge freshly penned in the record books, the 50 Summits Challenge is poised to build on that momentum and surpass in impact. We are seeking support from military, business and civic organizations who want to be a part of our team at the state or national level. With each of the 50 Summits Challenge trips taking part inside the United States, this unique program is sure to capture the attention of local, regional, and national news outlets. But more importantly, it will have a positive direct effect on the lives of our active duty, reserve, and national guard Air Force members. It's the sort of event any organization would be proud to be a part of. Your unit or organization can support the team by providing equipment/food/transportation during the trips, creating t-shirts for the participants, offering educational events on fitness/resiliency/outdoor skills, and by enabling us to involve wounded/disabled Airmen that require significant support logistics to reach their high-point. Contact us today to learn how you can be a supporter of the USAF 50 Summits Challenge and show your organization's support for this exciting and uplifting project.